HOUSTON—A year to the day since Hurricane Harvey slammed into Texas, Houston area residents are set to vote on whether to overhaul the region’s beleaguered flood-protection system, an election that local officials have cast as critical to the area’s future. On the ballot in Harris County is a $2.5 billion bond backed by property taxes that could more than quadruple the annual funding available to help shield Houston and the surrounding cities from flooding. The proposal, set for a special election on Aug. 25, is the largest bond measure ever offered in Texas’ most populous county. If approved, proceeds from the bond would help fund a range of projects aimed at significantly bolstering the area’s aging network of bayous, which serve as a drainage system for the flood-prone county. At stake, public officials say, is whether Harris County can ever realistically hope to protect itself from another storm of Harvey’s might. 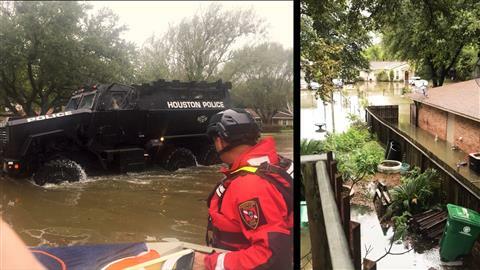 The storm caused 36 flood-related deaths in Harris County and flooded more than 159,000 homes, apartments and other dwellings, while also damaging thousands of commercial structures and businesses. But even before Harvey hit, some officials and experts had warned that flooding was going to worsen in the Houston area and that upgrading an antiquated drainage system would be costly. Local officials said increased funding would allow the county to finally complete flood-prevention projects that have been slowed because of a lack of money, as well as take additional measures it otherwise couldn’t afford. More than 200 potential projects have been identified including the widening of bayous, repairing flood-damaged infrastructure and buying out more than 1,000 flood-risk homes. Matt Zeve, director of operations for the Harris County Flood Control District, said some of the projects the county could finish could have helped thousands of homes flooded during Harvey. If the proposal is approved by voters, the flood control district’s annual budget could rise to more than $500 million from $120 million, he said. There is also the possibility of getting matching federal funds for projects the county can pursue if the bond measure passes, Mr. Zeve said. According to county estimates, the bond proposal would increase the total property tax by no more than 1.4% for most homeowners in Harris County. When disaster strikes, having a safety net like flood insurance, a stable income, or savings can mean the difference between getting back on your feet, and living every day among the wreckage. We profile two families in Houston still recovering from Hurricane Harvey six months after the storm. Since June, county officials have fanned out across the Houston area to hold community meetings on the proposal. At those meetings, Mr. Zeve said he saw the lasting effects the days of flooding had on residents. The measure has largely generated bipartisan support. Judge Emmett is a Republican, while Sylvester Turner, Houston’s Democratic mayor, also backs the bond. Gov. Greg Abbott, a conservative Republican who has called for reducing property taxes, approved the county’s request to hold the emergency special bond election, a requirement of state law. Kaaren Cambio, whose home flooded during Harvey, said she at first had concerns that the public wouldn’t be given enough of a say on how the money was spent. But after attending a community meeting, Ms. Cambio, who heads a flooding task force for the Harris County GOP, said those concerns were allayed. “I am never for higher taxes but in this case, this bond is necessary,” she said. Roger Gingell, general counsel, for Residents Against Flooding, a Houston group that advocates for flood prevention measures, said that while he planned to vote for the bond, he had concerns about what projects the money would be used for. Mr. Gingell said he wanted the county to take a more nuanced approach to flood prevention in areas that it had not previously focused on, in addition to emphasizing some of the same bayou widening projects it had in years’ past. “It’s pretty clear that we need the money to fund flood prevention infrastructure, but the government at both the city and county level has never articulated a big picture strategy for flooding in the region,” he said. Charles Goforth, president of the Brays Bayou Association, a residential group that works on flood prevention issues and represents 30,000 homes in an area of Houston hit hard by Harvey, said most people he has spoken to are supportive of the proposal. While some are uneasy with letting local government lead the flood prevention effort, Mr. Goforth said those fears have been eclipsed by an acknowledgment that since Harvey, there’s no longer much of a choice. “We live here and this is a situation we’re going to have to keep dealing with. So we have to bite the bullet,” he said.